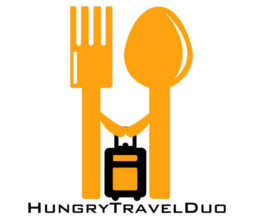 Home Featured	Atlanta Food Walks: Tastings, History, and a Cemetery? Atlanta is the city built on food and you’ll dive into its food-loving past while tasting modern Southern-inspired flavors. Like fried catfish and okra with cucumber wasabi sauce and raspberry hibiscus meringues. Before catching our bus to New Orleans for Halloween, Karla and I decided to explore the culinary palate of Atlanta. And honestly, it’s one of the best we’ve tried in our US trip. 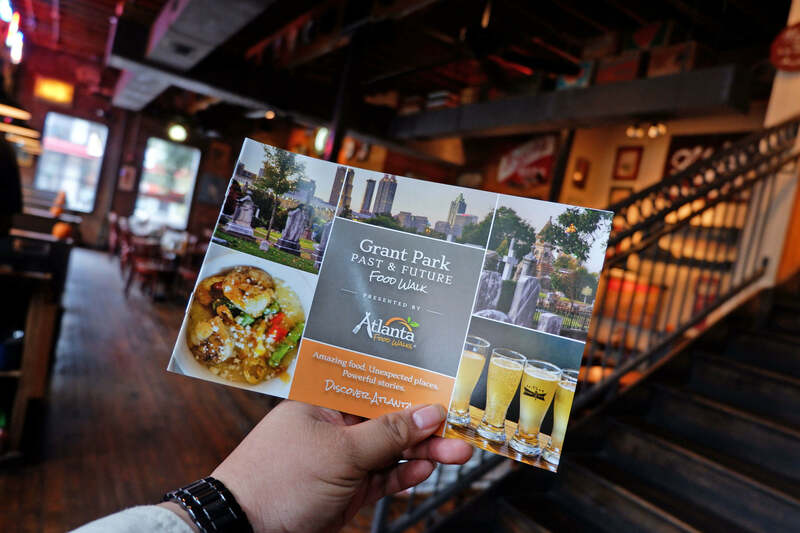 Check out our favorites from Atlanta Food Walks: Grant Park Past & Future Food Walk Tour. The Grant Park neighborhood was named after Lemuel P. Grant. A civil engineer from the Georgia Railroad who is otherwise called the “Father of Atlanta”. In the 1800s, Grant helped bring the railroad to Atlanta, opening up opportunities, and later on planned and supervised the construction of defensive lines around the city during the civil war. He then served in the committee to raft the new city charter of Atlanta in 1873. Grant Park, as a neighborhood, began to be populated in the 1890’s by middle and some upper middle class families. Houses were built with a very distinct architectural style (American-Victorian) which we both loved, especially those eerily-decorated for Halloween. Today, Grant Pak is a mix of both old and new residents of different age and racial backgrounds. And lined with highly local restaurants, breweries, and artisan shops facing the Oakland Cemetery. The Atlanta Food Walks tour features 12 modern and Southern fusion tastings from 5 locally owned food stops. It’s a 3 hour, 1.2 mile small group tour (there were 12 of us) around the Grant Park, including a ‘haunting’ jaunt through the historic Oakland Cemetery. First stop of our Atlanta Food Walks tour took us right into a popular seafood house called Six Feet Under Pub & Fish House. We were first met by Joy, our spectacular Atlanta Food Walks guide, who happily briefed us about our stops for the day and about the neighborhood itself. Few minutes after, we were then seated for our first meal of the day. Now I know the name sounds spooky (not to mention it’s located in front of Oakland Cemetery), but this hip pub hit all the right spots for me. We ate two lovely Southern favorites that still ‘haunt’ my tastebuds even after weeks passed. 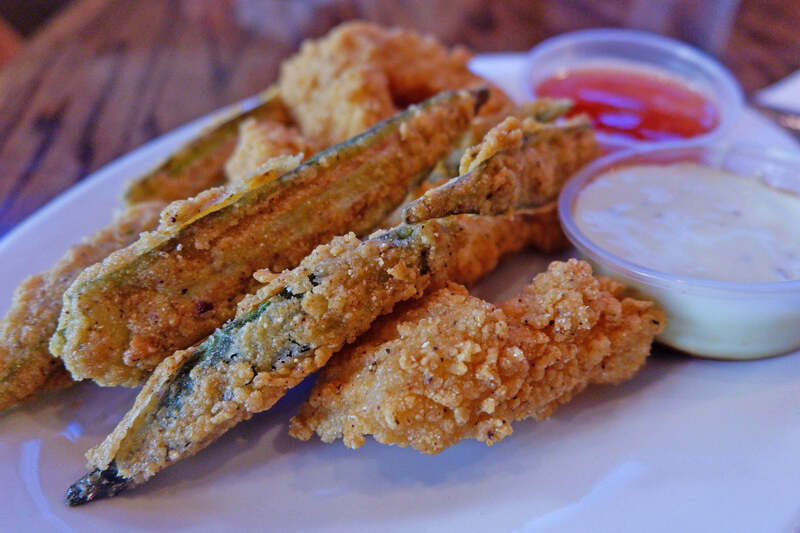 We first had the Fried Catfish with Okra Fingers. Now, for those who know me, I am not a fan of both catfish and okra. BUT, I guess I had an epicurean epiphany when I tasted these two in Six Feet Under. I loved how the peppery-crunchy-seasoning of the catfish and okra blended well with the spicy-savory taste of the cucumber soy wasabi and sweet and sour dips served. 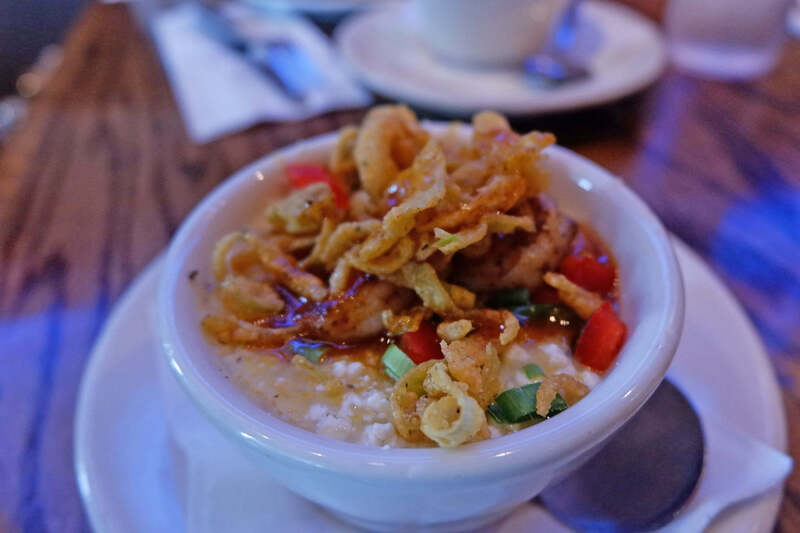 It was an even bigger party in my mouth when I paired the fingers with the best Shrimp Corn Grits I’ve had in my life. It was tasty, soulful, and had a lovely-grainy texture that I enjoyed very much. Definitely one of the best meals I’ve had in my whole US trip! It was a cold and rainy day when we took our Atlanta Food Walks tour but as they say, no amount of rain should and can stop a hungry foodie. So off we went around the block, marveling at the beautiful homes, en route to our second stop: Augustine’s. 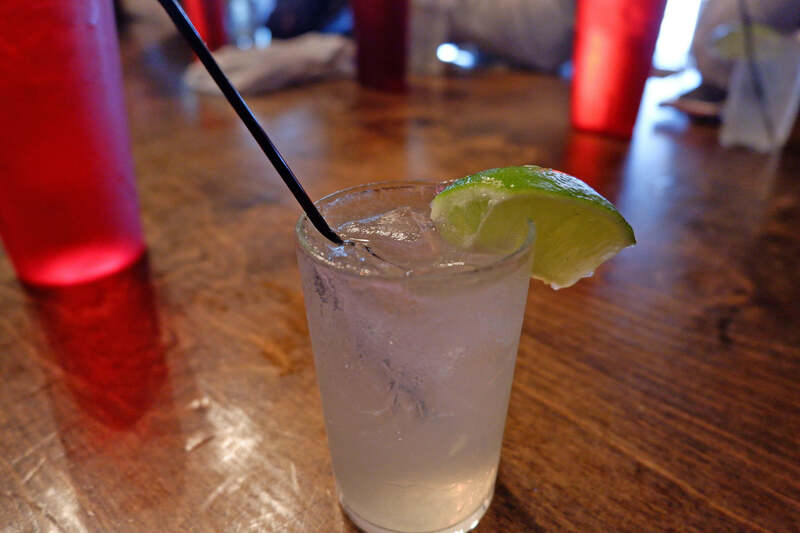 A favorite amongst locals, Augustine’s serves local brews and bar bites. 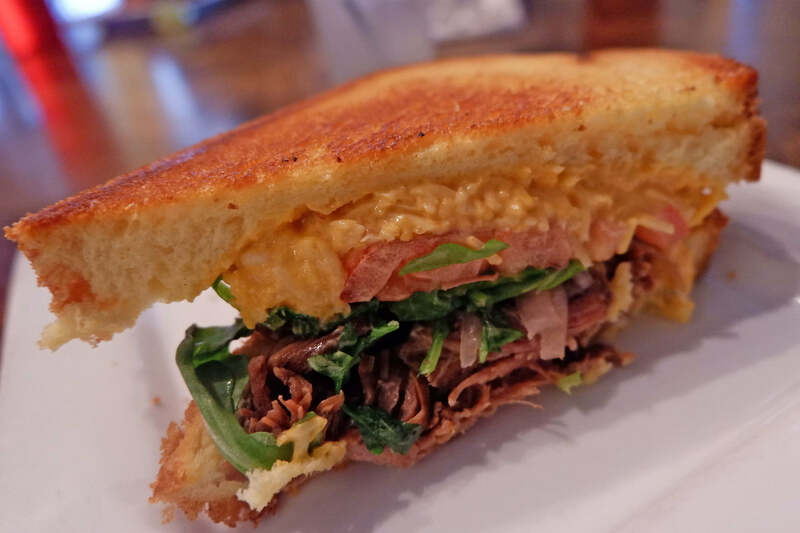 For Atlanta Food Walks, we dug into their 2 house bestsellers: the short rib grilled cheese sandwich paired with the honey-suckle ginger mule. With heaping bellies, Joy then led the group to the neighborhood’s famous landmark: the Oakland Cemetery. It was first founded as Atlanta Cemetery in 1850 on six acres (2.4 hectares) of land southeast of the city. And later on renamed in 1872 to reflect the large number of oak and magnolia trees growing in the area. By then, the city already expanded and Oakland Cemetery also grew to the current 48 acres (190,000 m2). Famous graves include Jasper Newton Smith, Margaret Mitchell (author of Gone With The Wind), and Maynard Jackson (Atlanta’s first African-American mayor). Thirsty? Head on to My Friend’s Growler Shop. Just as we did for the 3rd stop in our Atlanta Food Walks tour. And wine not, right? It’s Grant Park’s premier stop for craft beer, growler fills, and specialty wine. We had three craft beers on tap: Creature Comfort, Archie’s Oktoberfest Beer Lager (my favorite), and the Malt Face Lagger. We also got to try some of their local ciders to go (got the rootbeer instead). Nothing speaks Southern cooking more than good ol’ fried chicken with sweet potatoes. And that’s exactly what we grubbed on at the Republic Social House. 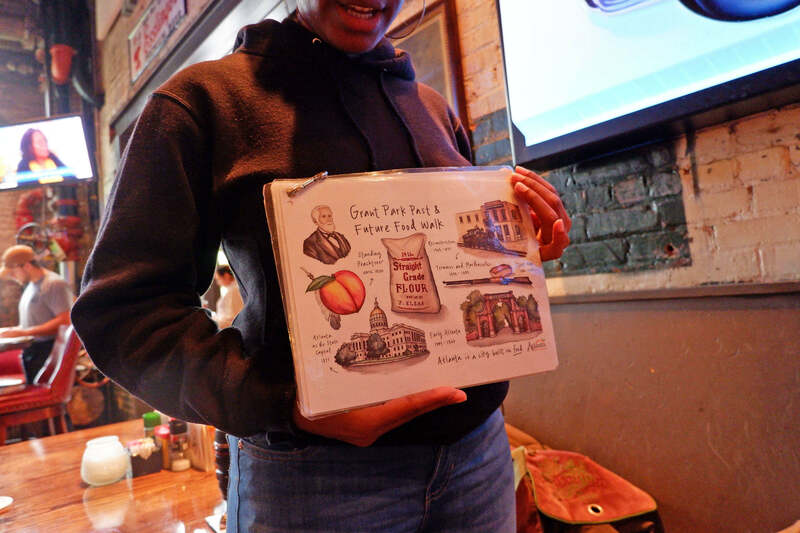 A quaint watering hole with quirky decor, the fourth stop of our Atlanta Food Walks tour took us back to classic comfort food. While I found the spiced-up flavor of the Nashville Hot Chicken interesting, I found the chicken a little dry for my taste. But I did enjoy the very Southern feel of the sweet potato fries that came with it. A French-inspired bakery, the Little Tart Bakeshop was certainly the icing on the cake that day. I took a peek inside and it was packed! And after having their bestselling Chocolate Chip Cookie and Apple Tart, I know understand why. The cookie was big and generous in chocolate chips, and had a soft ooey-gooey texture to it. The apple pie was also quite delightful – real apple slice bits that had the perfect sweetness. All in all, I’d totally recommend doing the Grant Park Past & Future Food Walk Tour with Atlanta Food Walks. Joy had a light yet engaging energy, friendly, and was very knowledgeable. In fact, everyone in the group loved her so much that no one wanted to leave after the 5th stop! The food tastings were good representations of what Atlanta tastes like – Soulful and TASTY. See you at the next bite! Previously: Ashveille Food Tour reviews.